With a commitment to overall player satisfaction, Wachesaw East’s plan also includes initiatives to increase service and comfort levels. 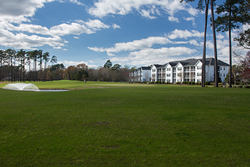 In January 2017, Zealandia Holding Company (ZHC) successfully closed on the acquisition of Wachesaw Plantation East Golf Club in Murrells Inlet. Wachesaw East has been recognized as one of best golf courses in Myrtle Beach, named Golf Course of the Year in 2007 and host to LPGA events from 1997 – 2000. ZHC recognized an opportunity to make Wachesaw East even better by providing capital for improvements, expanded player programs, improved amenities and service enhancements. · Tree removal to improve playability and turf conditions. · Bunker renovation and drainage improvements. · Replacement of cart paths. · General course beautification, including tee boxes and waste areas. With a commitment to overall player satisfaction, Wachesaw East’s plan also includes initiatives to increase service and comfort levels. The cart fleet will be up-fitted with a new technology pack, including USB ports for phone charging and GPS. A new restaurant concept is in the works, including improvements and expanded use of the outdoor bar and patio, ideal for leagues, group gatherings and events. The Pro Shop will also be updated with a new design and merchandising. Wachesaw East has also launched several new player programs for 2018 aimed at growing the game of golf in Myrtle Beach and South Carolina through junior clinics, seasonal leagues, group outings and lessons. One highlight is the popular Father and Son Team Classic golf tournament scheduled for July 19 - 21, 2018. For local players, the Wachesaw East “Frequent Player Program” has been revamped to include the new eSaver feature - a ticket to last minute deals for tee times. Golfers need to simply monitor their email for discounted tee times for last-minute play, up to a 75 percent discount off greens fees, complimentary practice range balls, and a new online booking engine for fast and easy reservations. Wachesaw Plantation East, one of the South Strand’s premier golf resorts, offers a Clyde Johnston-designed 18-hole championship course, driving range, short-game area and full-service bar and grill with outdoor patio. The course is located at 911 Riverwood Dr. off Highway 17 in Murrells Inlet. For more information please call (843) 357-5252 or visit http://www.wachesaweast.com.